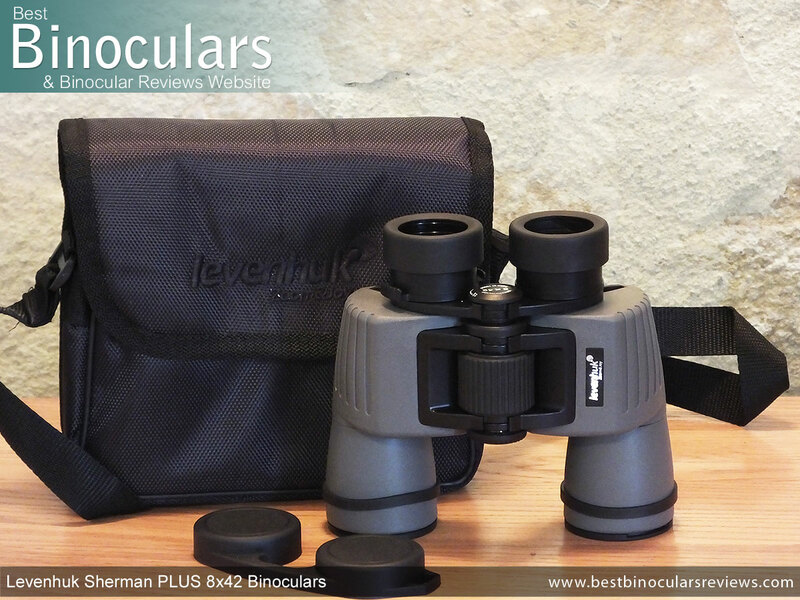 Levenhuk's family of porro prism Sherman binoculars is large: It consists of three sub-groups, the 'standard' Sherman's, the 'top-of-the-line' Sherman PRO's and the mid level Levenhuk Sherman PLUS binoculars. 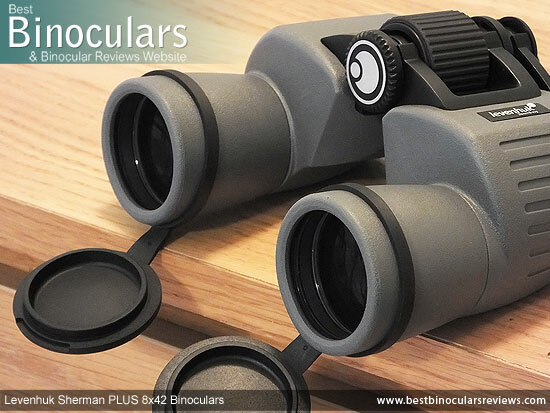 Then within each of these sub-groups there are a number different objective size and magnification options to choose from... in all, I counted 15 different models. This thickness should provide more protection from impacts, but is countered by the hardness of it, which will not absorb as much energy as softer rubbers. 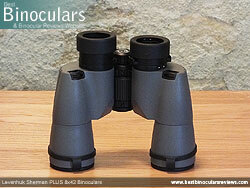 However the harder rubber exteriors usually lass a little longer and are less prone to perishing. This hardness also provides less grip than softer rubbers, however Levenhuk have countered this a little by adding a fine texture to it. So whilst not the most tactile surface, it is also far from what I would describe as slippery it is a definite improvement on a smooth plastic or metal exterior. Whilst they don't mention it in any of the material provided, my suspicion is that Levenhuk make the chassis from plastic, which at this price point is the norm. Whilst this may not match higher specification instruments with metallic bodies in terms of strength and luxuriousness, the advantages include being more lightweight and that it will not corrode. Levenhuk describe this Sherman as having a 'hermetic shell' and thus as well as being waterproof, it stops any moisture or dust from getting into the interior. 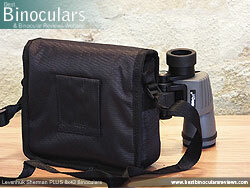 The interior is also filled with nitrogen, which is moistureless and so stops any internal fogging of the lenses. Unscrew the dust cap from the central hinge and it revels a thread that will accept almost any tripod adapter enabling you to easily fix the Levenhuk Sherman Plus 8x42 binocular onto a tripod should you wish. 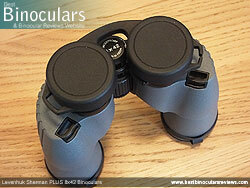 Like the main chassis, the main Eye-Piece housing as well as the sub-structure of the eyecup look to me to be fashioned from a type of plastic. So whilst it would be far preferable to have these parts made from metal which if far more likely to survive a drop, in this low-cost price range this is to be expected. The mechanisms on the twist-up and down cups worked well enough on my sample, however I will say that it was noticeably tighter on the left side than the right. Whilst this is not an issue as both were tight enough so as not to move too easily by accident, but at the same time loose enough so as to make them easy to twist up and down when you want to, it does highlight the very small difference in tolerances and build quality that you get on lower costing products like this when compared to higher end instruments. The cups themselves are very typical in that the have a thin rubber coating to help with comfort, which is aided by their very wide diameter (4.5cm). 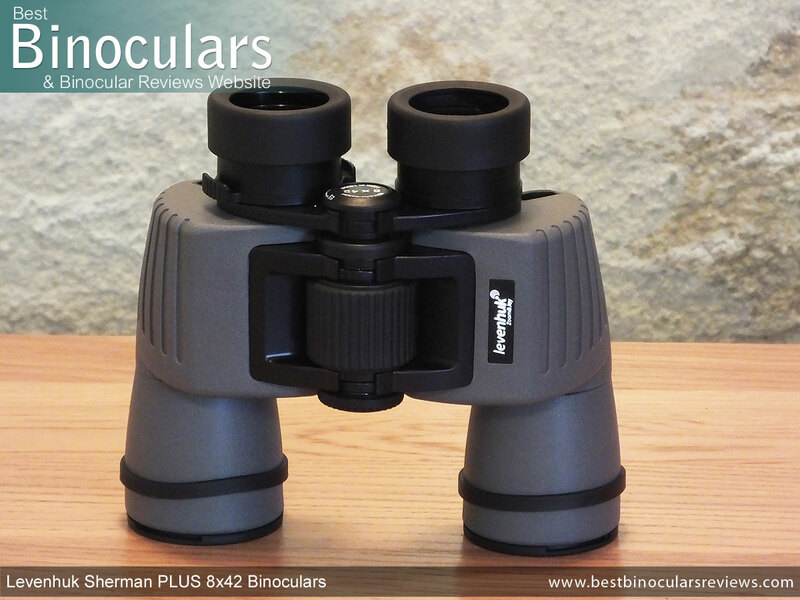 Unlike most roof prism bins that place the focus wheel right at the back almost in between the eyepieces, these Levenhuk Sherman Plus binos have the focus wheel located within the center of the central hinge, a feature that is quite common amongst instruments that use porro prisms. This does require a slightly further reach, but it should be fine for the majority of users, unless you have particularly small hands. I did find that the wheel on my sample was a touch too tight for my personal liking, making it a little harder to turn that what I would have liked. The focus mechanism is very aggressive on these as it only takes about ¾ of a turn (270°) to move from infinite right up to the minimum focus distance. The advantage of this is that it is very quick to make large focus adjustments, but on the down side, this along with the tightness of turning the wheel made fine adjustments a tiny bit harder than what I would have ideally liked. I would like to stress that this is a very minor point and also partly my personal preference and there are many out there that will prefer this to a lower geared focus mechanism. Under the right eyecup you will find a ring that when turned adjusts the diopter setting, which plays an important roll in setting up the bins to your particular vision, especially if you have differences between your left and right eyes. Unlike on some premium bins, the ring is not lockable, but it is tight enough so accidental movement is not too easy. The absence of a scale or markings is a shame, however it is fairly simple to make your own mark, should your setting not be on neutral. Likewise their dimensions, especially their width are pretty high for a 42mm bin. However remember that this is a porro prism shaped instrument which is quite different to the roof prism designs of the others on the list. 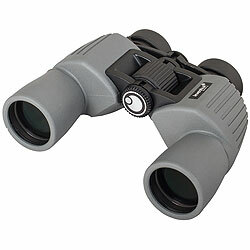 Also keep in mind that their width places the objective lenses further apart, which as I have already discussed has the advantage of offering a more stereoscopic view for better depth perception. Even so, if compactness is an important feature that you are looking for, then these will probably not be the choice for you. It is quite often the case that if you only have a very limited budget for a pair of binoculars, then you are better off buying a pair that uses porro prisms rather than roof prisms. 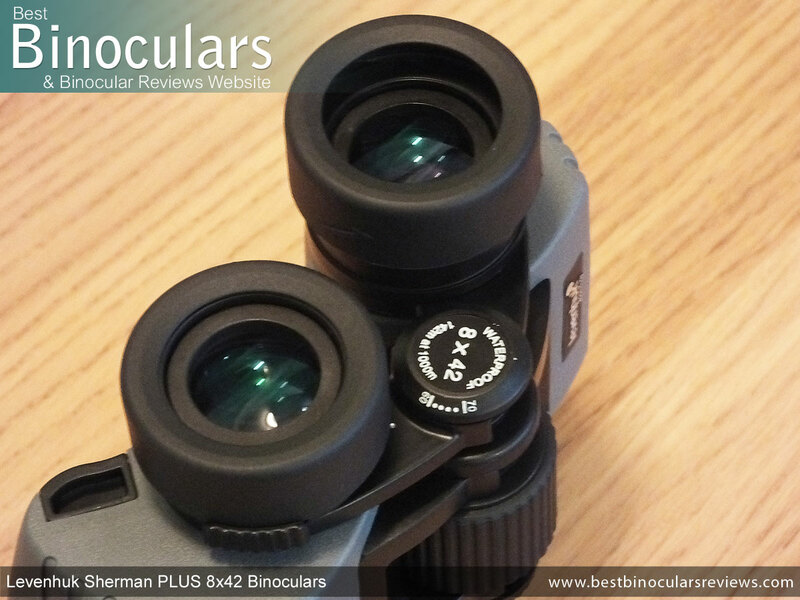 This is because they do not require high reflective mirror and phase correction coatings on the prisms that are both expensive and technically difficult to apply to achieve the same performance level as that of a roof prism. According to the manufacturers, the eyepieces on these Levenhuk Sherman Plus 8x42 binoculars are made up using four-elements arranged into three groups. I also measured the exterior lens as having a diameter of 22mm, which for a 42mm bin is fairly typical. Each of the 42mm objective lenses is made up of two elements arranged into one group and I really like the fact that the exterior lens surface is set back at around 9mm from ends of barrels on the body of the instrument. Being slightly encased like this within the body offers them plenty of protection. Both in terms of physical damage, but as well as from falling rain or even just to help prevent dust from settling onto them. As I have already mentioned, the general shape of the body and the fact that the eye pieces don't line up with the 42mm objective lenses indicate to us that the Levenhuk Sherman binoculars use porro prisms and not roof prisms to correct the image inside the device. 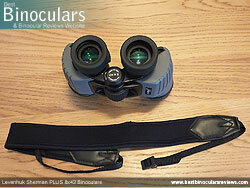 At first I was pleased to read in their specifications that Levenhuk chose to use prisms made from BaK-4 glass and not BK-7 which is often used on cheap binoculars like these. 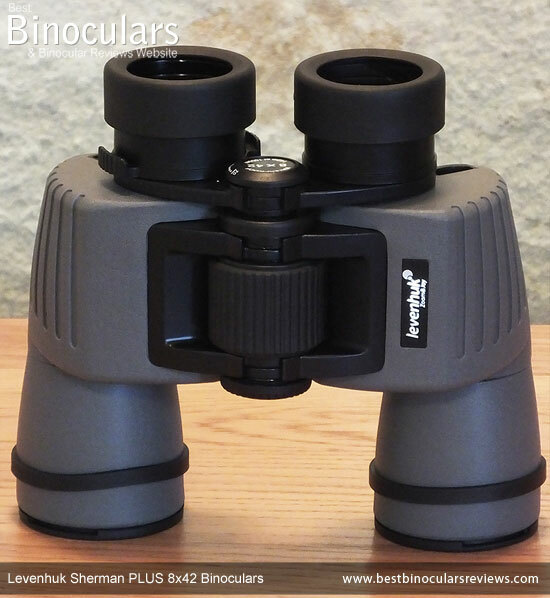 However I then became a little confused when I also read on the Levenhuk website that the "optics of the binoculars are made of BaK-4 borosilicate glass." The problem with this statement is as far as I know, BaK-4 is made from a Barium crown glass and BK-7 is a Borosilicate crown glass? You can sometimes tell which type of prism glass has been used by looking at the exit pupil from a small distance as is illustrated above. I tried this with the 8x42 Levenhuk Sherman and to me it looks perfectly round? I will try and clear this up for you, but for now I suspect that theses do indeed use higher quality Bak-4 glass, which I am sure will be made from Barium crown and it is only someone in the Levenhuk marketing department who had got confused, which is good news. The Levenhuk Sherman Plus 8x42 binoculars are advertised as having Fully Multi-Coated optics, which is also great news. Once again there will be some instruments within this low cost price range that will either not coat all the glass surfaces (Multi-Coated) or only apply a single coat to them (Fully Coated) to save costs. 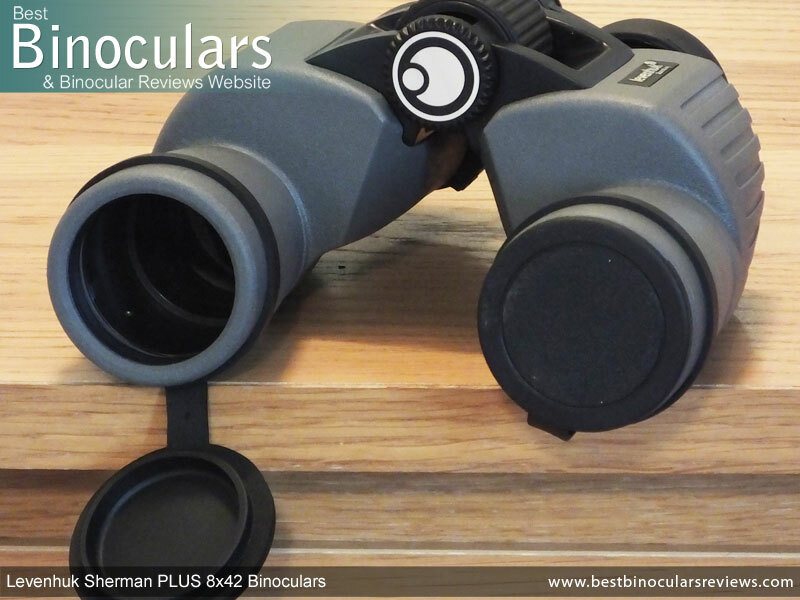 A fully multi-coated optical system will far outperform the other options in terms of image brightness and quality as it ensures more light not only gets to your eyes, but there is less interference along the way. (Take a look at this section on Anti-Reflection Lens Coatings if you want to learn more). This 8x42 Levenhuk Sherman Plus binocular has an angle of view of 8.1° which is really impressive and makes them a truly wide angle binocular. 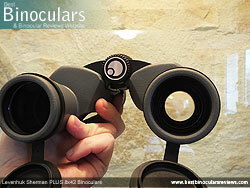 At 21mm the eye-relief is also more than adequate for those who wish to use these bins whist wearing eye-glasses. 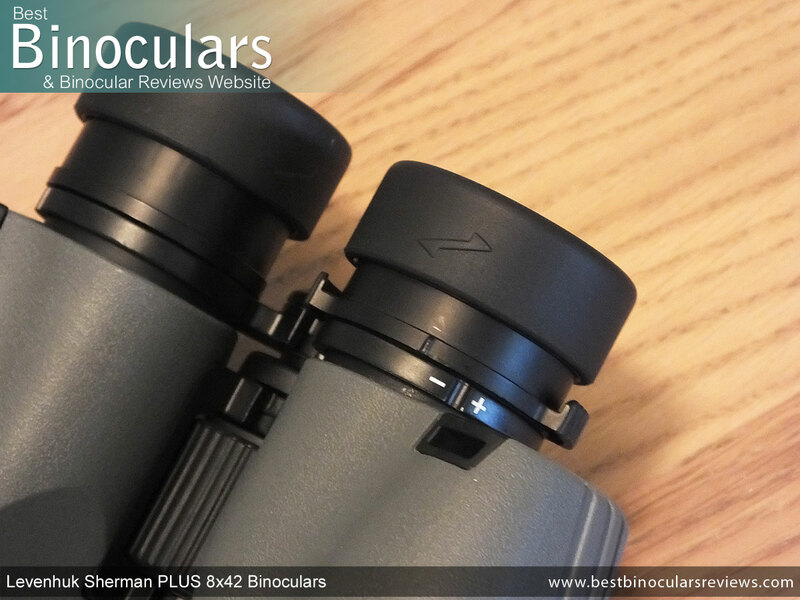 The close focus distance is 9.8ft, which is a little on the long side, but totally understandable considering the wide FOV and amount of eye-relief. 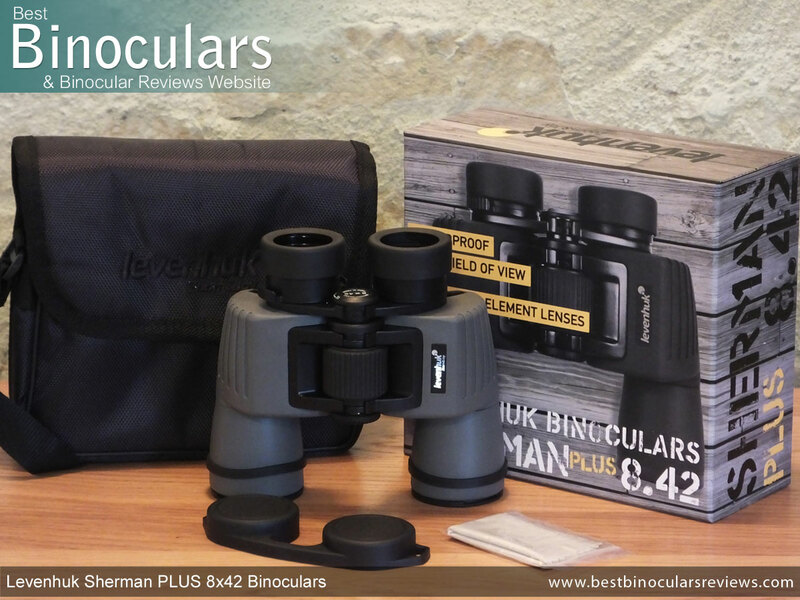 However it does mean that the Levenhuk Sherman Plus 8x42 binocular may not be the ideal choice should you often like viewing objects at close range. 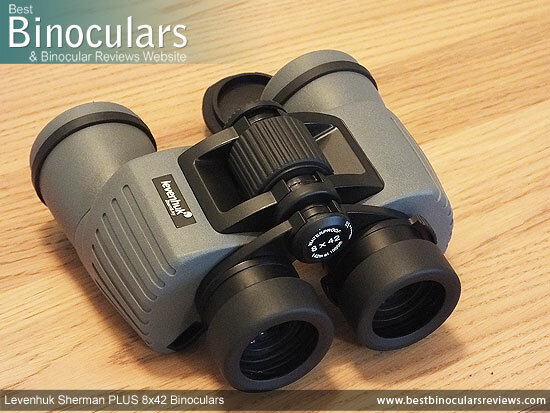 The good use of the relatively simple porro prism design combined with a fully multi-coated optical pathway and BaK-4 glass (I think), should translate to a reasonably high quality view when compared to other 8x42 binoculars, especially those within their price range. Whilst most certainly not as vivid as my high end 8x42's the view through these Levenhuk binoculars is still what I would describe as having a good level of contrast and with colors that look neutral. The important point her is that the view is not dull, nor is it washed out and there is no sign of tinting that I sometimes observe on cheap binoculars that use lower quality glass. 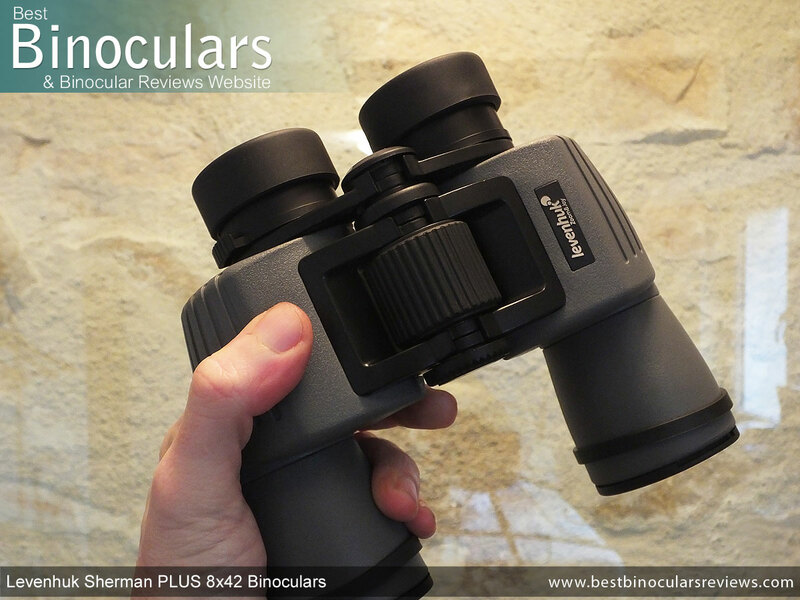 In both good and very poor light (at sunset), the image brightness seemed to match that of my mid range 8x42 binoculars, whilst both were a tough less bight than my high end benchmark in the bad light. 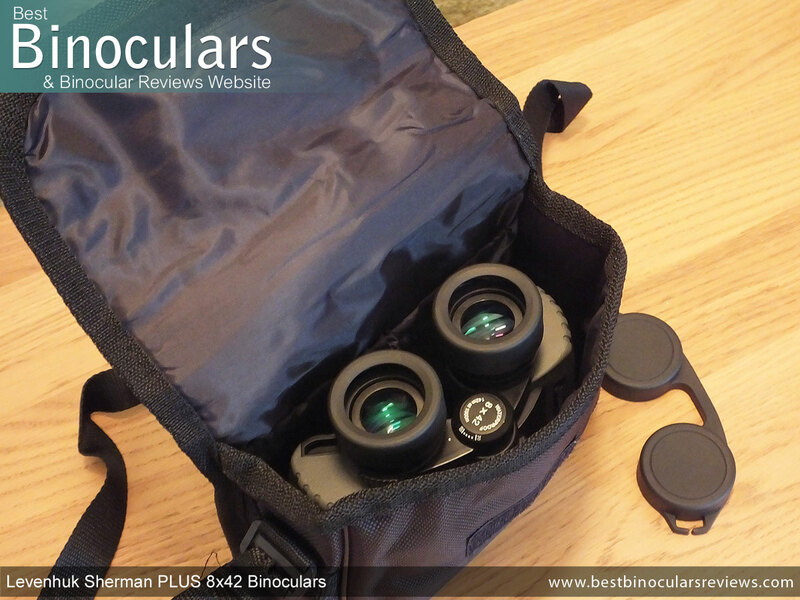 This is what I would have expected to observe and so I would say at this price level with this level of optics, these perform well in low light, but not brilliantly and will easily be a match for any at this price point in my experience. As with almost every binocular I have tested, color fringing around the edges of highly contrasting objects is evident. However it was no more than what I would consider to be normal that is level. At no time during my use, testing of these did I notice any distortions (like curving etc) to the image. I was also very impressed by just how little image blurring that there was right at the edges of the view, which is an area that is quite often a factor on cheap binoculars. 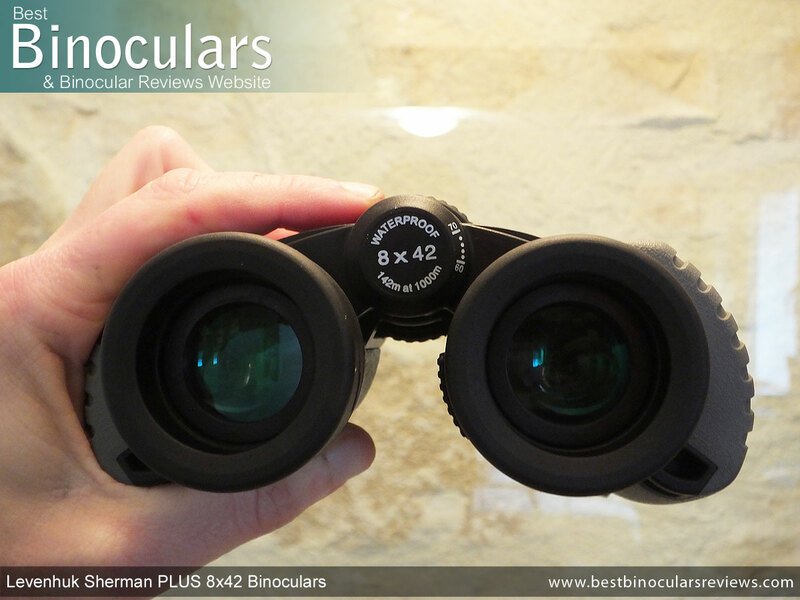 I think it is quite plain to see that for the most part, Levenhuk used up most of the budget for the Sherman PLUS on the actual binocular and then have tried to keep the costs down as much as possible on their accessories. To be fair to them however, it is really difficult (probably impossible) to produce an instrument that retails for around $100 and at the same time spend a lot of money on things like the neck strap and carry case. Flip over lid fastened with a strip of Velcro is quick to access, but not as secure as a Zip and the ripping sound when opening can startle wildlife/birds etc.